Beautifully designed and decorated in a warm and inviting mountain style Boulders condo awaits your arrival. As you step in you'll be welcomed by an open concept living room, gather around the coffee table for a game night, enjoy a movie or spend the evening on the deck enjoying a BBQ. This condo sleeps comfortably 6 people, the master suite has a queen, the guest bedroom another queen and the 3rd bedroom is set-up with a bunk(twin over full). Enjoy a fully equipped Home Away from Home on your next vacation. 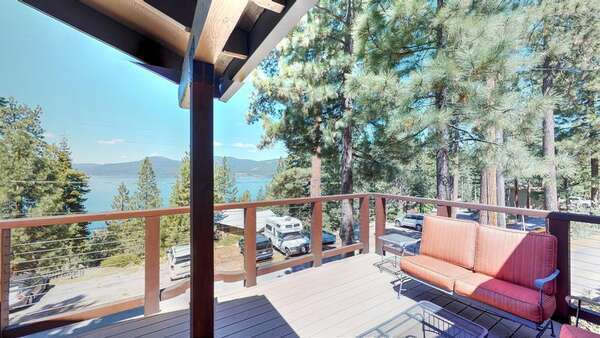 Hurry and book so you may soon enter peace and tranquility with natural Tahoe surrounding, knowing everything is close by including the help and knowledge of Tahoe Signature Properties. Truckee Cinnabar Vacation Retreat is centrally located in Truckee, offering easy access to Hwy 80 and 89 and just a short drive to Donner Lake, Lake Tahoe, Squaw Valley, and Downtown Truckee. Feel free to walk to the grocery store just around the corner and also to several restaurants, as well as a coffee shop. This newer family community contains private views from your balcony and a recreation center available to you within walking distance which includes a full-size pool, hot tub, gym, bocce court, volleyball court, and horseshoe pits. Looking forward to making your next vacation the best one yet!